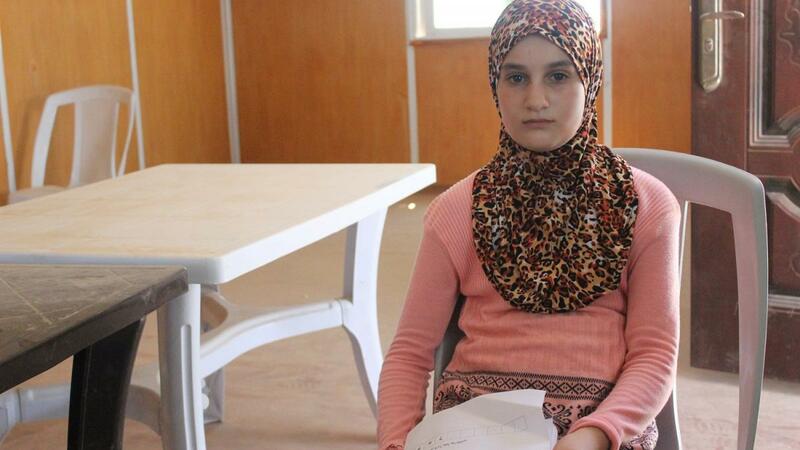 She had barely finished second grade when the events of the Syrian crisis began to unravel, changing her life forever. With newfound civil unrest and war, as storms of bullets and bombs engulfed her town, Salma would hide behind her mother, screaming and crying until the outbursts of violence subsided for another day. Her home was later ransacked of all food, items and furniture; even her bed was stolen. It all came to a head when her home was destroyed in a random bombing in front of her eyes. The attack caused her grandmother to go blind since she was in the house at the time of the attack, which led to Salma experiencing deep psychological trauma. After what happened to their home, Salma’s family decided to leave Syria and head to Jordan in May 2013. The journey was long and arduous for her family, carrying whatever remained of their belongings and escorting her blind grandmother through rough roads and hills. Upon arrival at the Za’atari Refugee Camp in Jordan, Salma broke down in tears at the sight of so many children at the reception tent, as it made her believe that Syria will no longer have any children left. Despite this, Salma was optimistic about her new home and was expecting to see something beautiful, but she felt heavily disappointed when all she found presented to her family was a white tent and a few things to help them live inside the camp. A while after, her family was given an eight-person caravan to make life a little easier for her blind grandmother. In July 2015, Salma heard of an organisation called War Child which takes great interest in children’s wellbeing and education; helping them to learn basic literacy and numeracy and providing psychosocial support activities through their iDEAL programme. She registered in the full programme, funded through UNESCO-EU, and has been attending every day since it started. Now Salma recommends registering with the War Child/UNESCO-EU programme to all her neighbours’ children, and feels deeply grateful for all the psychosocial and educational help she is receiving through them.